F.W. Murnau's Nosferatu is an unauthorized adaptation of Bram Stoker's Dracula. It recounts the eternal battle between good and evil, love and hate, innocence and death. A young man must combat the devil incarnate in the form of the sinister Count Orlock, better known as Nosferatu - The Undead, in order to save his soul and the woman he loves. Nosferatu represents one of the first treatments of the Vampire on film and remains a classic in cinematic history. This updated version will both thrill and horrify new generations for years to come with an original soundtrack by Type O Negative. Murnau's Nosferatu can truly be called The First Vampire. Yes, I'm watching horror when my father can't! I had to do it!! I've seen Nosferatu before. The movie was good, you're basic (and first, after the Dracula book) vampire story. Since it was shot silenmtly, I always had to rush when it came to reading, or paused it time after time, which got a little annoying. The background music was awesome in my opinion. (Keep on rockin', Type O Negative!!! ) The black and white and no sound didn't bother me, except for one thing - - - it seemed so peaceful with that nice horror-like music that I near fell asleep while it was going, and, keep in mind that opening intro included, the movie moved to end credits about an hour in. That is when it was redone with the music and the introduction from David Carradine. So it was basically redone in 1998 so they slapped 1998 on it as the year. I ended up leaving it that way in profiler... I just can't decide if I agree with it or not... I keep going back on forth on it. Terror is One Missed Call away in this got-your-number shocker based on the hit Japanese thriller Chakushin ari. Does the viral spree of calls have a single source? Is there something that links the victims? Psych student Beth Raymond (Shannyn Sossamon) and detective Jack Andrews (Ed Burns) scramble for answers. And they're working fast. Because Beth just discovered an ominous message. The movie was pretty interesting. When I saw the commercial back when it arrived in theaters, I couldn't wait!! This, surprisingly, was my first time seeing it. My only regret about this movie is..well...I was kinda dissapointed in the deaths. I thought they'd all be murdered when they get the calls! I don't think I'll expose anything by saying most of the deaths seemed like accidents. I can't help but feel they should have been pulled away in a bloody trail, still screaming in their last seconds.........what can I say? It's what I expected. Also, the ending is keeping me wondering. When the demon child was gone, Jack's phone called Beth, but the ringtone was normal. I don't get it. He called her, will she die? But the spirit is gone, and the ringtone is normal!! Ugh, I hate cliffhangers! All in all, it's a good movie, I just it needs a little more help to be on the scary side. At the most, I was only slightly creeped. I remember not caring for this one too much. I may have to give it another go when I can watch horror again. 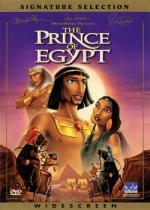 An epic adventure and milestone in cinematic achievement, The Prince Of Egypt has captivated movie audiences the world over, becoming one of the top animated films of all time. Unparalleled artistry and powerful Academy Award - winning* music bring this beloved story to life as never before, with unforgettable characters voiced by a roster of stars as impressive as any ever assembled for a feature film. This is the extraordinary tale of two brothers, one born of royal blood, one an orphan with a secret past. Growing up the best of friends, they share a strong bond of free-spirited youth and good-natured rivalry. But the truth will ultimately set them at odds, as one becomes the ruler of the most powerful empire on earth, the other the chosen leader of his people. Their final confrontation will forever change their lives  and the world. Both spectacular entertainment and a celebration of the human spirit, The Prince Of Egypt stands as a classic for the ages, for audiences of every generation to enjoy and cherish. *1998 Best Original Song "When You Believe"
Wow. I remember so much of this. The plagues. Death of the first born son. Turning the sea to blood. The movie is very well done, though I don't recommend it for children (the very young, might be a bit too strong when it came to deaths and the plague.) it was a great retelling of Moses' journey. There is really not much else to say. Stunning animation and sensational songs await you in the enchanted land of Camelot. A spirited teenage girl named KAYLEY answers to the call of adventure when RUBER the evil knight steals KING ARTHUR'S legendary sword, Excalibur. Aided by GARRETT, a handsome, blind squire, Kayley embarks on a thrilling quest to recover the sword and save her beloved kingdom. Along the way, these two unlikely heroes meet up with one outrageously funny creature — a wise-cracking, two-headed dragon named Devon & Cornwall. On their magical, musical journey, Kayley and Garrett discover the unlimited power of friendship and courage. You'll Discover dazzling, fun-filled entertainment in QUEST FOR CAMELOT. This is actually an old favorite of mine. Though I love the story and the spirit, it suffers from one flaw - - -too much music. I personally think a song or two is plenty. But, C'mon! A song just for the villain to explain his plan? A song where the dragons impersonate Elvis and Sunny & Cher? Ugh. Nonetheless, still a favorite! I wouldn't be surprised if I felt like watching it again! One song is one song too many! Unlike Dad, I'd be ok w/ 2 or 3. Maybe 4. Where I put my earplugs? I'm getting a package together for your father...and I'm including a DVD with music! Kathy... You wouldn't!... would you? I already have! It's in the pile of things to go. I'm over here cracking up just thinking about you watching it! And I do remember you saying that if someone sent you something you would have to watch it! Ah but Pete...you never said you had to turn the volume on!